You will pass through neighborhoods with sumptuous palaces owned by people from around the world who come to enjoy the calm and gentle way of life of the palmeraie. But there is also a rural life in the Marrakech Palmeraie. You will encounter little shepherds with their flocks of sheep and black-haired goats, and admire the ruins of the khettaras, the ancient irrigation system. Stop and sip a glass of mint tea in a lush garden. The tour will take you for a ride on dirt roads, far from the bustle of the Medina of Marrakech. 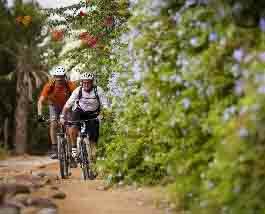 Cycling is the ideal way to discover the palmeraie during your visit in Marrakech.